I was reminded of this absolutely fantastic tip on Monday when visiting one of The Body Shop stores to find their blended Tea-Tree oil is now being sold at an eye-watering £7 a bottle (it’s only a blend, not pure). However, all you need for this is a bottle of pure essential tea-tree oil. I’ll start by saying that I’ve always preferred Boots Botanics Essential Oils as the oils are always of an excellent grade and seem not to spoil as quickly as some others. Take your favourite moisturiser which must be relatively oil free as if you’re oil / blemish prone as you shouldn’t be slarting your face in rich, greasy oils anyway. Then add 1 single drop of pure essential Tea-Tree oil to the product in your hand before applying it to your skin. Use roughly the amount of moisturiser you see pictured in the palm of my hand above (or maybe a little bit more than that). 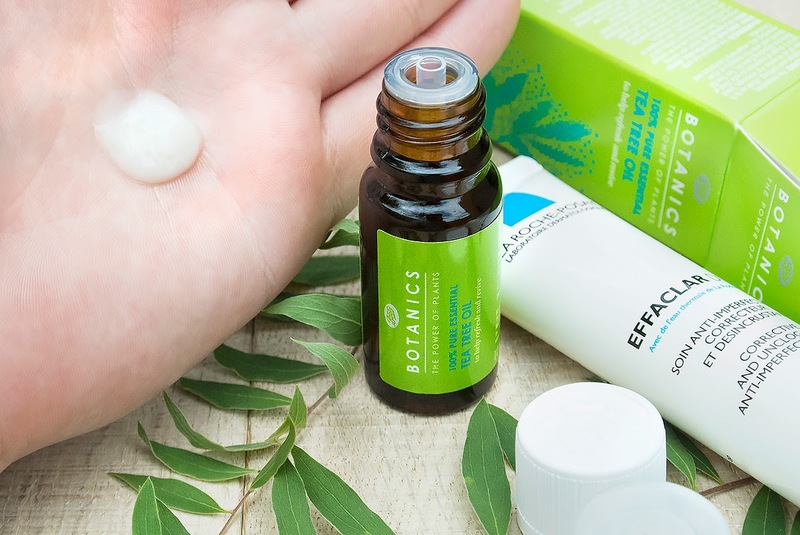 The blemish fighting, antibacterial and antimicrobial properties of pure essential Tea Tree will immediately get to work as it’s pulled deeper into your skin by your moisturiser of choice. For the photos, I used La Roche-Possay Effaclar Duo [+]; an already excellent all-in-one treatment for blemishes, acne, spots and excess oiliness. Don’t apply the mix to your eye area (you’ll learn that one quickly) and to start with, don’t do it every day (every 2/3 days at night should be fine). You must also ensure to test it on a small area of your neck and leave it for 24 hours first, just in case you react as some people can be sensitive to essential oils. Finally, only ever use 1 drop; 100% pure essential Tea Tree oil is hugely potent and a bottle like this should last you an eternity. For some bizarre reason, Boots Botanics 100% Tea Tree Oil isn’t available at Boots online (it isn’t being discontinued) but you can buy their double size, 20ml bottle here for just £7.99. This article first appeared on MANFACE written by Thom Watson. It was published on Wednesday 16th July 2014 and was last updated on Monday 3rd April 2017 at 1:59pm. It's categorised under Acne, spots & blemishes, Boots, High Street, Special Care where you'll find more related content.